World Taxonomist Appreciation Day, March 19, was created in 2013 to make a point that the work of the world’s biological taxonomists was largely unappreciated, even though it underpins our fundamental understanding of the diversity of life (click for two portraits of Museum taxonomists from Victoria and Western Australia). Why does this matter and what does it mean for the State Herbarium of South Australia? In case you’re not even sure what taxonomy is and why it is a core part of the Herbarium’s role: taxonomy is the practice and science of classification (taxonomy really began as a science in the 18th century, with the Swedish botanist Carl Linnaeus, whose naming system is still used). 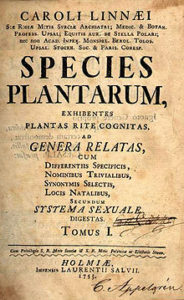 Linnaeus’ SPECIES PLANTARUM (1753) is the starting point of botanical nomenclature. For biologists, taxonomy means the classification and naming of organisms in an ordered system that is intended to indicate natural relationships, and especially evolutionary relationships. This process uses a combination of the form, shape and structure of an organism (its morphology), and behavioural, genetic and biochemical observations. Taxonomic scientists follow rules that govern this process to ensure that their work is able to be adopted anywhere in the world. Herbarium taxonomists also seek to meet high scientific standards and use an evidence base that can be built upon in the future. They work to develop identification keys which can be reliably used by others and come to the same conclusion (which means the identification of a unique organism). The different kinds of animals, fungi, plants and microorganisms are referred to as ‘species’. A species is often defined as a potentially interbreeding group of organisms that can produce viable offspring. This may be because the two different species cannot interbreed and produce viable offspring or that they live so far apart they cannot either. 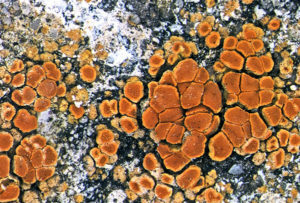 Caloplaca aggregata, a new species of lichen from Kangaroo Island, described in 2016. Photo: G. Kantvilas. Taxonomists provide unique names for species that allow us to study them in more detail and ensure that we are all recognising the same thing. To describe a new species to science, taxonomists first sort specimens into separate sets they believe represent potential species. Once the specimens are sorted the next job is to see whether or not they already have names. This may involve working through identification guides, reading descriptions written perhaps 200 years ago, and borrowing named specimens from museums or herbaria to compare with the sample. Such comparison may involve external characters, the need to dissect internal structures, or even molecular analysis of the DNA. If there is no match, the specimens may represent a new species, not previously given a name. The taxonomist then has to write a description, including ways in which the new species can be distinguished from others, and make up a name for it, in a Latin format. The name and the description must then be properly published so that other taxonomists can see what has been done, and be able to identify the species themselves. From finding the specimens to the name appearing in print can take many years! Specimen boxes in the vaults of the State Herbarium of South Australia. Comprehensive collections of identified specimens and their collection information, curated in perpetuity by museums (for animals) and herbaria (for plants, fungi and lichens), form the evidence for the identity and occurrence of each species. The ‘type specimen’ is particularly valuable as it represents the actual specimen used as the reference for a new species name. Interestingly, most new species are not discovered in the field, but during the painstaking process of examining already collected material in herbaria and museums. 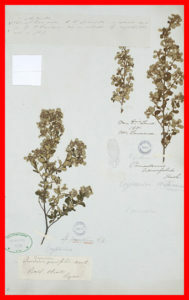 The type specimen of Spyridium parvifolium, from the Herbarium of the Royal Botanic Gardens Kew, London. Global literature shows about 1.1 to 1.5 million described species, with estimates for the total number of species in the world ranging from 5 to 10 million. With all that taxonomic work to be done, it may come as a surprise to learn that taxonomists themselves are endangered (see also Wägele et al. 2011). In Australia, we know we are losing taxonomists at the rate of two to three per year, and the workforce is definitely ageing (as a local example, the average age of the State Herbarium’s taxonomists is 60 years and most of them are volunteers). Worldwide, we are unarguably well shy of the effort needed to catalogue Earth. It has been estimated that to discover and describe all species would take 300,000 taxonomists some 1,200 years, at a cost of more than $350bn. And this is a conservative estimate. We are deep in a taxonomic crisis. Our own species created the planet’s sixth major extinction event (see also Hance 2015) and we are lacking the expertise to understand what we are rapidly losing. Taxonomic work is the foundation for understanding how to save what we can and make plans for the future. Any fix to the taxonomic crisis requires a recognition of the essential nature of the work of taxonomists, the value of the herbarium and museum collections and those who use them to explain our world. Do we need to describe everything? With extinction running at 100–1,000 times what is called the ‘natural rate’, you could argue that we are fighting a losing battle and should cut our losses. But if we are to direct our limited resources into conserving the most important parts of our biological diversity, how do we know which species and systems are the most important? Taxonomy is the first big step in that process. Solanum osteocarpum from Central Australia, newly described in 2016. In Australia, we have an immense job ahead of us documenting life on our 7,000,000+ square kilometre continent, where more than three-quarters of the native plants and animals are found nowhere else on Earth. In just over 200 years, we have described about a quarter of the estimated half a million or so species. Are there new sources of food, medicine or building materials out there? Of course. Which species can we afford to lose if life as we know it, and pertinently human life, is to continue? What relatives of crop plants will help us survive climate change? How many and which plants do we need to produce oxygen for us to breathe? 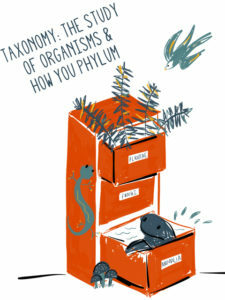 Taxonomy is critical for almost everything we do in biology, and as a community, we need to support taxonomy and its practitioners – if not to make our life better, then because our life depends on it. This entry was posted in News on 19 March, 2017 by Jürgen.